Emilia Romagna is a region in northern Italy famous for its fine charcuterie, which can make avoiding meat dishes there particularly challenging. One of the nicknames of my adoptive town is "Bologna la grassa", or "Bologna the fat". Then there is Bologna's world famous ragu, the pasta sauce known in the UK as bolognese. This is a city where meat rules supreme. But it is not fair to single out Bologna when really the entire inland part of Emilia Romagna, a region of northern Italy, could be dubbed Emilia la grassa. An hour away is Parma, the home of parma ham. Even Modena, just 20 minutes from me, has its own porky specialities, traditionally eaten at this time of year. This is probably the only region where you will find a central piazza boasting a bronze statue of a porker. Forget patron saints and heroes of the unification, round here the pig is king. For many visitors the meaty specialities are an attraction but, from a culinary perspective, I could not have chosen a worse place to live. The thing is, I do not eat meat. And for a local population where high cholesterol is in the DNA and pork scratchings are considered fine charcuterie, this is beyond comprehension. They look at me with astonishment and pity. "You do not eat meat?" they ask, with the same tone I remember using when a girl at school told me she was allergic to chocolate. "You choose not to eat meat?" they say, their perplexity now infused with just a hint of disgust. "Well, I do eat fish," I tell them apologetically, as if to save myself from being totally shunned. "I'm not a vegetarian." Don't you ever feel like you're dying for steak? Vegetarianism is considered an exotic illness here, while the word "vegan" is almost completely unknown. In case you think I am exaggerating, my neighbour recently asked if I would take part in one of her market research surveys. "Dany, do you fancy doing a prosciutto cotto tasting?" Prosciutto cotto is cooked ham. "Gabriella," I smiled, "I do not eat meat, remember?" She looked at me genuinely nonplussed: "But it is not meat, it is prosciutto cotto." My smile burst into a laugh. Going to a traditional restaurant (or trattoria) is an amusing experience too. I always know what I am going to have - tagliatelle with mushrooms. It is not because I have a passion for tagliatelle with mushrooms, it's just that I know it will be the only meatless dish on the menu. OK, there are ricotta-filled tortelloni, but I'm not that partial to them. Unlike ordinary locals, waiting staff barely flinch when I utter my near sacrilegious phrase: "I do not eat meat." Determined to appear unfazed, they chirp "no problem". Then follows a script I've heard so many times I laugh before the punchline. Firstly they say "no meat but a bit of affettati misti, si?" I explain that cold cuts are meat, even if the slices do not look like the original animal. Then they tell me plenty of their pasta dishes are vegetarian. "We have home-made tortellini," they beam. I explain that, even though you cannot see it, the meat stuffing inside those tiny pasta packages nevertheless exists. But my favourite is when they tell me they have a delicious vegetable sauce. "It is made with peas and onions. Well, there is a spot of bacon too, but just a tiny bit - you cannot even taste it." That is when I stifle a chuckle and order my tagliatelle with mushrooms. In 2010 a group of Italian chefs organised a worldwide day of action to promote the "authentic recipe"
Main courses are much more straightforward. There's absolutely nothing. Even if they list 10 options, they'll all once upon a time have had legs. Nowadays, I don't even ask, I just get a side order of grilled vegetables because, chances are, the potatoes are roasted in lard. And now Emilians are glorying in the meaty treats they got in their Christmas hampers. There is cotechino - a huge sausage they boil and serve with lentils on New Year's Eve. Then there is zampone - similar but stuffed into a pig's trotter. 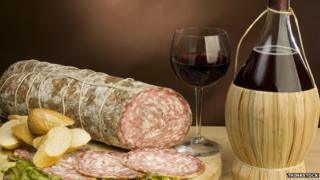 It is a speciality of Castelnuovo Rangone - a little town near Modena which once had more pigs than people. Every winter they hold SuperZampone, a festival where local sausage makers try to break their own world record for the largest zampone ever. Yes, you may have guessed - it is the town with the pig monument in the piazza. Right in front of the church, much to the priest's indignation. He must be a vegetarian.